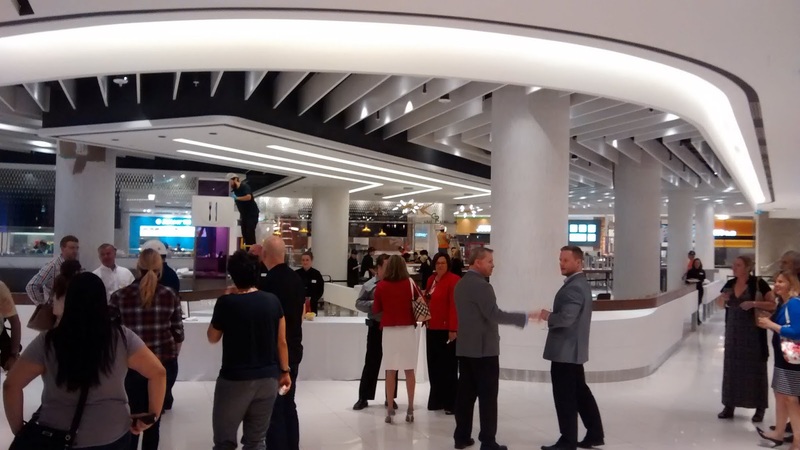 Wednesday evening I had the opportunity to preview the new Rideau Centre's Food Court which will be officially open Friday August 1st at 11 A.M. The event started promptly at 5 P.M. with treated to cocktails and hors d'ouevres. Nothing like a glass of Jackson Triggs Chardonnay to start off an evening. I spent about an hour wandering around the limited area of the food court we were allowed to. Attendees were limited at first to the area they could roam due to construction still being finished up on quite a few store fronts including the Green Rebel. Obviously with a preview, finishing up construction and minor cleaning was to be expected. But considering some of the storefronts were still saran wrapped in covered in construction dusts, I don't expect everything to be ready by Friday. One reason for the possible unpreparedness by at least a day is the hydro outage that occurred on Monday that forced many stores to close and probably the food court construction to be halted. However, there was at least one storefront ready and excited to open. Purdy's Chocolates was open and ready for business with their Hedgehog Mascot available for pictures and an exuberant Master Choclatier making Raspberry Truffles. After finishing the wine and some snacks I took one last round of the food court area. The food court was most definitely brighter, newer and shinier than old one located at the front of the mall whose last day was today (July 31st). The newer food court is also much larger and more spacious than the older one that can be harder to find a table at. 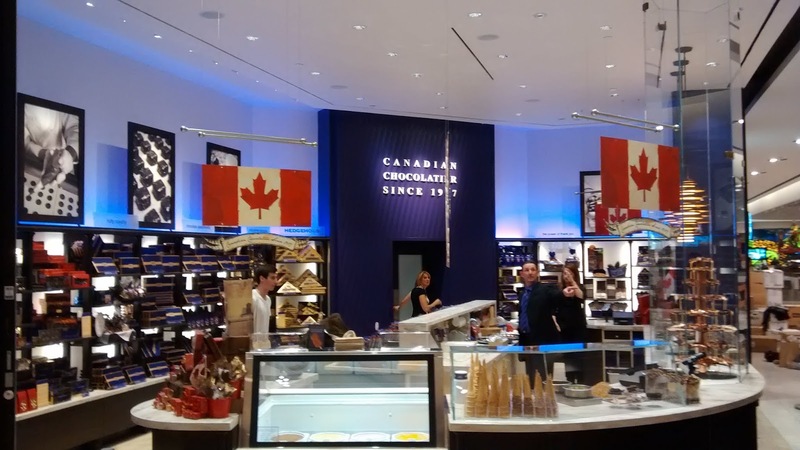 As well, the new food court has many new restaurants from Montreal and the Toronto areas that I have yet to test out with a few food restaurants carrying over to their new locations. Finally the food court's ambiance is hopefully going to be improved with the new modern design, the introduction of international food offerings and the introduction of dishes. Despite all the positivity and A few nagging questions though do remain. The new dishes and cutlery are to be introduced in hopes of reducing the amount of garbage the traditional food court. 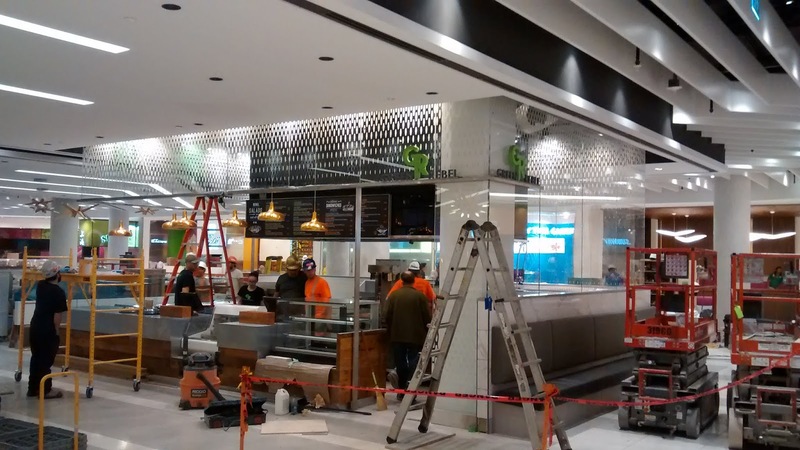 But how is the new food court going to keep said dishes from walking out the door? As well traditionally the older food court tended to be occupied by a lot of interesting characters at times who loitered there. How will this issue be resolved especially with the introduction of metal knives now being used? Finally, many of the prices at the old food court for simple fast food lunch heading towards the $10.00 mental barrier for an affordable lunch, will the new Rideau Centre Food Court going to entertain economical prices for it's customers? These questions will be easily answered over the coming days and weeks as the reviews from the average diner come in and the amount of china decreases. Overall, the new Rideau Centre Food Court has been correctly marketed as a grand new place to eat. Although, there are lingering questions around pragmatic issues like dishes disappearing and increase the quality of clientele over the old status quo food court. Will this component of the continuously hyped Rideau Centre renovation and expansion live up to its billing or will it be a gradual flop with the possible return of fast food containers and undesirables? Only once the doors open August 1st at 11 A.M. and over the next couple of weeks will we be able to tell if this was marketing company genius' success or flop.